POLQA is the global standard for benchmarking voice quality of fixed, mobile and IP based networks. It was standardized by the International Telecommunication Union (ITU-T) as Recommendation P.863 in 2011 and can be applied for voice quality analysis of VoIP, HD Voice, 3G, 4G/VoLTE and 5G networks. The latest version is POLQA v3 (2018). 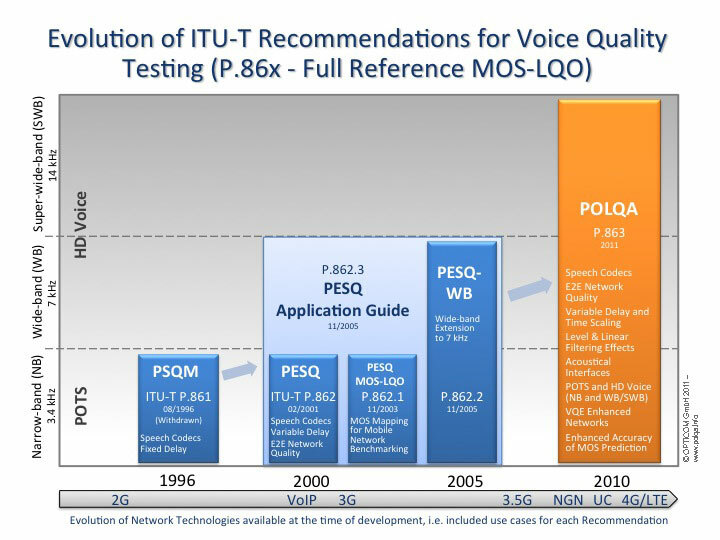 The POLQA standard was developed during 2006-2011 by leading industry experts within ITU-T Study Group 12, from the requirement for a technology upgrade of its predecessor from 2001, PESQ (ITU-T Recommendation P.862), and a competition carried out to define the 3rd generation of perceptual voice quality metrics. POLQA - originally derived from the ITU working title "Perceptual Objective Listening Quality Analysis" - offers an advanced level of benchmarking accuracy and adds significant new capabilities for super-wideband (HD) and full-band voice signals, along with support for most recent voice coding and VoIP/VoLTE transmission technologies. POLQA is ideally suited to evaluate, optimize and monitor the voice quality of next-generation networks and deliver the standardized, validated P.863 Mean Opinion Score (MOS). The POLQA perceptual measurement algorithm is a joint development of OPTICOM, SwissQual and TNO, protected by copyrights and patents and available under license from OPTICOM as software for various platforms. The POLQA Coalition has further advanced P.863 by developing a new Edition 3, available as version v3, “POLQA 2018”, which was consented by ITU-T SG12 in February 2018. To date, 111 vendors and operators license POLQA/P.863 for their products or for use during development, design and optimization of mobile phones, Smartphones, network components, or services. Mobile Network Operators (MNOs), Test & Measurement and in particular DTT manufacturers for benchmarks of 4G/LTE, NGN and 5G networks. PESQ/P.862.x was originally released in the year 2001. Since then, and as shown in the time line diagram above, certain key technologies like speech codecs and 3G/4G/5G evolution have been introduced. While PESQ has proven to be very robust, POLQA significantly improves benchmark accuracy and support for testing of today´s technologies such as Unified Communications, Next Gen Networks and 4G/LTE. Besides classical band-limited telephony POLQA supports HD Voice, i.e. 'wideband' and ’full-band’ telephony up to 48 kHz sampling frequency. The new POLQA v3 forms a major upgrade to the established industry standard for benchmarking voice quality in mobile networks and ensures POLQA is “5G ready”. Edition 3 of P.863 is a significant step forward and brings a lot of improvements and extensions while maintaining full backward compatibility. Edition 3 was consented by Working Party 2 of ITU-T Study Group 12 on 15 Feb. 2018 and is now undergoing AAP process. This approval period typically lasts for four weeks, and is scheduled to end 12 March 2018. Commercial implementations will be available from OPTICOM thereafter. Interested in scheduling a meeting at MWC19? Leading Test & Measurement manufacturers have (or shortly will have) adopted POLQA/P.863 in their products covering a wide scope of applications from lab tools, over production testing, network design and optimization to benchmarking and monitoring. In order to find out which is the proper tool set for your application, you may look up our reference list of licensed POLQA vendors. Academic users who are looking for a download of reference source code on the ITU-T website should consider that Recommendation P.863 is defined by an algorithmic description and pseudo code for some essential parts of it. For professional vendors looking to integrate POLQA into their product or system, easy accessibility to POLQA is assured. The parties to the POLQA Coalition have founded a joint P.863 patent pool with OPTICOM as sole licensing agent. This means OPTICOM will provide one-stop IPR licensing along with advanced POLQA OEM software tools for various platforms. The POLQA coalition consists of OPTICOM, SwissQual and TNO, the group of companies who won the competitive standardization process run by the ITU-T, and KPN, who own essential patents on the TNO technology. The candidates submitted for testing by OPTICOM, SwissQual and TNO were the only algorithms that clearly met the criteria in the ITU-T selection phase in June 2010. Thereafter, OPTICOM, SwissQual and TNO have agreed to combine their expertise into a joint and uniform solution. This joint solution was standardized as ITU-T Rec. P.863 (2011). POLQA enabled products are available to end-users in hardware and software from various vendors – see our list of references. OPTICOM acts as the sole one-stop licensing agent for the POLQA technology on behalf of the POLQA Coalition, while SwissQual, TNO and KPN take a more passive role with regard to POLQA licensing.